A PETA eyewitness exposé reveals that Canada Goose’s down assurances are all wet. Please urge Canada Goose to stop selling down immediately, and let the company know that you won’t buy any of its products until it does so. With so many humane, warm materials available today, including PrimaLoft, Thinsulate, ThermoBall, and Plumtech, there’s no excuse for using down. As if it weren’t bad enough for outerwear company Canada Goose to use fur trim from coyotes caught in steel traps and shot or bludgeoned to death, we now know that the company is filling its jackets with down from abused birds. A PETA eyewitness exposé of a Canada Goose down supplier reveals that workers rounded up panicked geese, grabbing and carrying them by the neck, as they struggled with their entire weight hanging from their necks, and crammed them into densely packed cages for transport to slaughter. After a trip from the farm to the slaughterhouse lasting over five hours, the geese watched, terrified, as others right in front of them were shackled and killed—until it was their turn. Canada Goose misleads the public by claiming that the birds it uses for down get freedom from fear, pain, distress, and physical discomfort. The company tells customers that it is “deeply committed” to the “ethical sourcing of all animal materials”—but it’s a lie. See for yourself what really happens to birds used to make Canada Goose down-filled jackets and help stop this abuse. To make it faster to round up the geese for transport to slaughter, they were herded into small wire pens, where they visibly panicked and trampled each other. Geese on the bottom of the pile were crushed. At least one died, and a worker tossed the dead bird over the fence. These distressed geese are climbing on top of each other in panic and fear, and some even suffocate. After the geese were confined to the pens, workers started grabbing them by the neck—often two in each hand—and hauling them to transport crates, as they shrieked and flapped their wings in distress. One worker repeatedly stepped on some geese while reaching for others. Then they were crammed into the crates with such force that the cages can be heard clanging in the video. The birds were crammed into cages so small that they were unable to hold their heads up even while sitting. A veterinarian who viewed the footage said, “Being confined to these small crates for prolonged periods would cause painful muscle cramping, unnecessary stress, and predispose anxious birds to injury.” After a trip down the highway to the slaughterhouse lasting over five hours, some geese were left in the feces-covered crates for up to 24 hours without food or water. The Canada Goose supplier featured in the exposé—James Valley Colony Farms—sends geese to Schiltz Foods in South Dakota—the largest goose slaughterhouse in North America—a grueling five- to six-hour journey, often in frigid temperatures. Why Do They Have 'Red Elbows'? 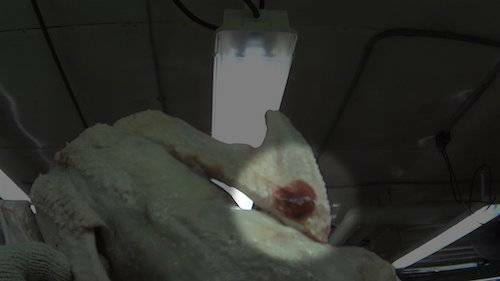 Every time someone purchases a Canada Goose down-filled jacket or any down-filled product, they could easily be supporting the horrors that you see in this video and worse. PETA has filed a complaint with the U.S. Federal Trade Commission and Canadian Competition Bureau for deceiving customers regarding the welfare of geese used for down in the company’s products. 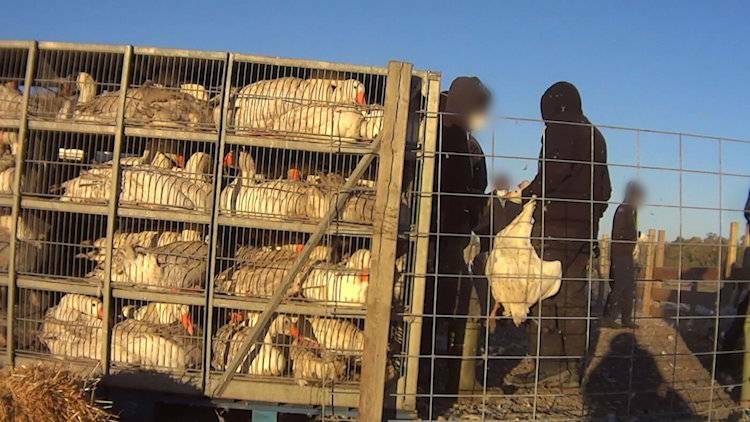 If you feel that you were misled into purchasing a Canada Goose product by the company’s claims of “[e]thically sourced down and fur” and “humane treatment” of animals used for its coats, please e-mail us your story at [email protected]. 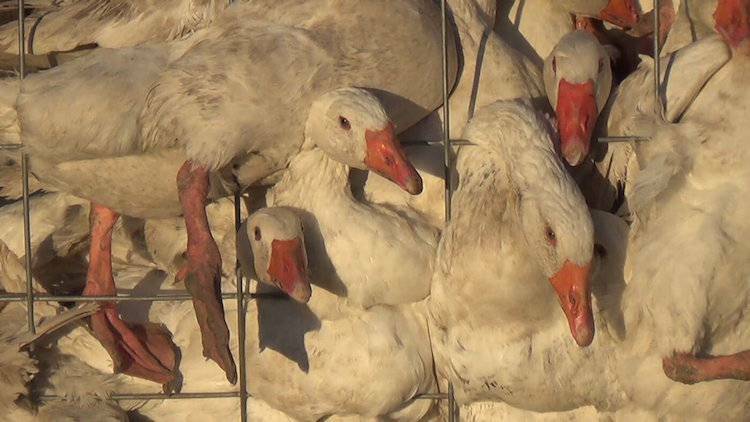 The best way to help geese suffering right now is not to buy anything containing down. 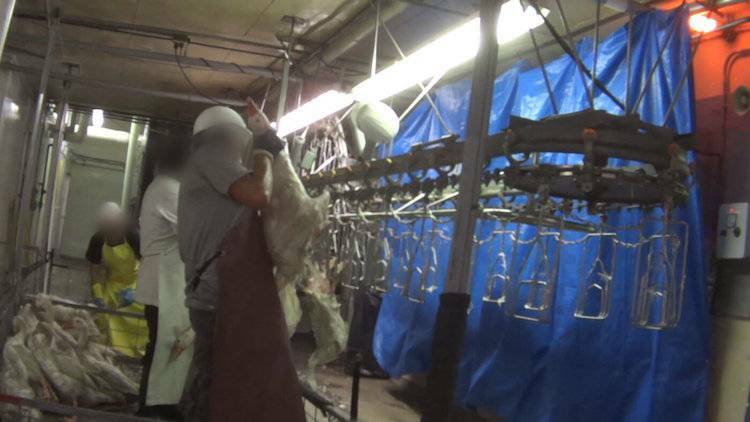 Canada Goose could easily ditch down today—urge the company to do just that!